Just over a year ago, we wrote about the public consultations that were taking place as part of the Ontario Ministry of Labour’s (“MOL”) Changing Workplaces Review. This review is part of the MOL’s broader mandate to modernize employment and labour laws in an effort to strengthen protections for “vulnerable and precarious” workers and, as we are constantly being reminded, support businesses in today’s evolving economy. Specifically, the review sought input on changes to Ontario’s Employment Standards Act, 2000 (the “ESA”) and the Labour Relations Act, 1995 (the “LRA”). Yesterday, the MOL released the much anticipated Interim Report. 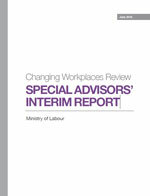 While the initial public consultation attracted broad and significant interest from interested parties, particularly unions and employee rights activists (who provided the lion’s share of submissions), the Interim Report was released to focus the multiplicity of issues and spur further stakeholder involvement. It is clear that the Special Advisors who authored the Interim Report were concerned that not all interested parties had made submissions nor even understood the scope and impact of the outcomes. The Interim Report seeks to ensure that no one is taken by surprise by the process or by recommendations that may ultimately flow from the review. Exceeding 300 pages in length, the Interim Report is premised on the theory that vulnerable workers and precarious employment exists in Ontario and is a problem that needs to be addressed. The Interim Report contains no specific recommendations. Nor it is judgmental. Rather it reads like an anthology of modernization options. It summarizes the current law, recounts generally the submissions received through the consultation process and sets outs various options for reform based on the consultation process, academic research, approaches in other jurisdictions (both within Canada and abroad) and the authors own thinking. All of this is presented through the lens of protecting vulnerable workers and enhancing business competition in a globalized and changing economy. The Interim Report is divided into two parts. The first part addresses LRA reform. Most of the options in this section orient towards increasing unionization rates whether through relaxing certification rules, allowing organizing or consolidation of bargaining units on by industry sector or geography, or adding more severe consequences to employer misconduct. This is not surprising because the unions dominated the volume of submissions during the consultation process, proposing a wide array of reforms. The employer community was quieter on the LRA and most submissions simply advocated for status quo. The second part deals with the ESA. Here, every section of the ESA is addressed in one way or another. The sheer spectrum of options presented in the Interim Report on ESA reform—some of which are extremely creative—is mind-boggling. The Special Advisors certainly showed great skill, fortitude, patience and detailed thought in this section. It is important to repeat that this Interim Report does not contain any proposal or recommendation. Ultimately that is what the review process will conclude with, but it will be up to the Ontario Government to pass any reform measures. Given the magnitude of the Changing Workplaces Review, there is an inevitability to significant changes being made to Ontario’s ESA and LRA, if not a total overhaul (with the exception of the LRA construction sections which were not under review). August 31, 2016 – Submissions on the Personal Emergency Leave provisions under the ESA are due. October 14, 2016 – Submissions on all other subjects in the Interim Report are due. Three popular articles this week on HRinfodesk Does the Tribunal have the power to deal with allegations of “unfairness” at work?